→ Checking the avaibility of marks and the novelty of design. → Filing Trademark and Design applications. → Dealing with examination procedures by Official authorities. → Monitoring renewal and maintenance deadlines for Intellectual Property rights. → Registering of Domain Names. → Renewing Trademarks, extension of Designs and Domain Names. → Recording modifications of rights on National, International and European Registries (Trademarks, Designs, Patents) and on authorized Registrars for Domain Names. → Monitoring trademarks, company names, domain names and designs. → Filing, monitoring and dealing with administrative enforcement proceedings. → Judicial actions in infringement and unfair competition together with a specialized lawyer who may appear before the Courts. → Auditing portfolios of rights with respect to valuation, sale or acquisition of assets projects, alone or in cooperation with law Firms and Chartered accountants in charge of the deal. 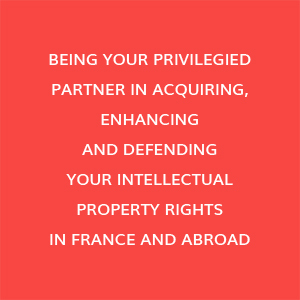 → Advising on all questions related to Trademark, Design, Appellation of Origin laws as well as Copyrights, Domain Names and Unfair Competition. → Developing awareness and providing knowledge to your teams in the field of Intellectual Property, Domain Names and Unfair Competition.